CSMB is an IT support company based in Fleet that was founded by experts Colin Malcolm and Steve Brook in 1997. The main business goal since then has been to help keep businesses ticking over with the minimum amount of fuss, especially where other support companies were unwilling or unable to fix problems. Dedicated to surefire business continuity, finding the correct solution for each client, and impeccable customer service, CSMB are always working to stay at the forefront of commercial IT support. Having had the same website since the company was founded, CSMB needed a design update to reflect their quality service, growth, and larger client base. They had also just rebranded from CS Malbrook to CSMB (as part of which Thunderbolt assisted with logo redesign and brand guidelines) and wanted their new site to reflect this shift, with a focus on appearing more modern and sharp. The Thunderbolt team designed and built a clean, professional website with simple UX that made finding out about the various services offered by CSMB as easy as pie. Contact information was placed in an information tab rather than on the home page to help differentiate between enquiries and visitors looking for a phone number, making customer tracking far easier. We also made various amends to ensure that the site loaded in the recommended amount of time (under three seconds), so as not to frustrate potential customers. In an effort to step away from more typical appearances and tired stock photos, our designers implemented bright colours and contrasting geometric-style graphics for a more unique and contemporary look. 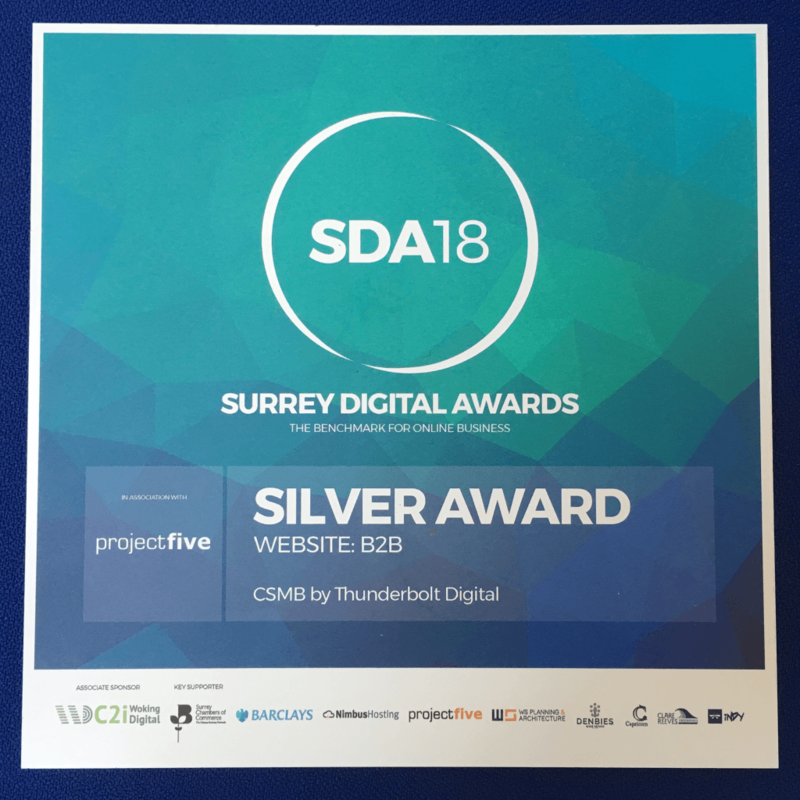 This clearly made an impact, as CSMB’s website won a silver award in the B2B Website Category at the 2018 Surrey Digital Awards – which was even sponsored by a direct competitor!